When Lupita Nyong’o said that all our dreams are valid, she actually meant it. Time and again, life presents us with opportunities and it is always upon us to decide whether we take the opportunities or not. A young boy from Kibera, Wilstan Onditi saw his opportunities and grabbed them. His greatly utilized his great scientific mind to get great results in last year’s KCSE. His great results have now come in handy as he was on Tuesday awarded the Inaugural Kenyan Coders Tuition Scholarship by Moringa School. Moringa School is an intensive tech education program offering a five-week prep and five-month course. It is a world-class coding accelerator with a direct education to the employment model. The focus is to enable a whole generation of high-potential, pro-active young people who are passionate about technology. Half of the ten scholarships for 2019 are designated for students living in informal settlement areas around the city. The school is looking to roll out the scholarship across the country in the near future. “Inclusivity is something that is key to Moringa’s operations. 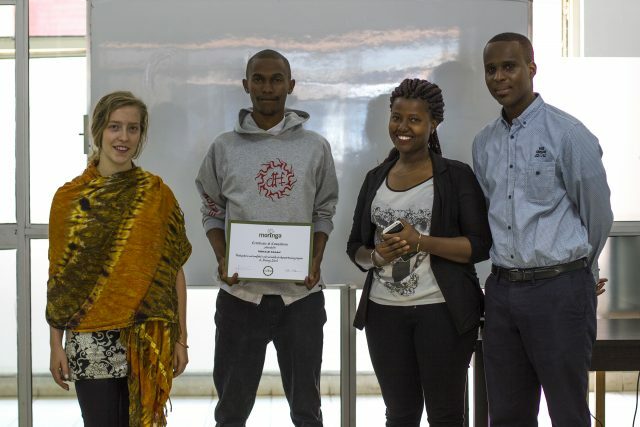 In order to reach our goal of transforming Kenya and eventually, the continent, it is important for us to break down the barriers to quality higher education,” said Nelly Agyemang-Gyamfi, Senior Access Manager at Moringa School. Kibra MP Ken Okoth commended the school for the initiative. All the Best Wilstan Onditi.